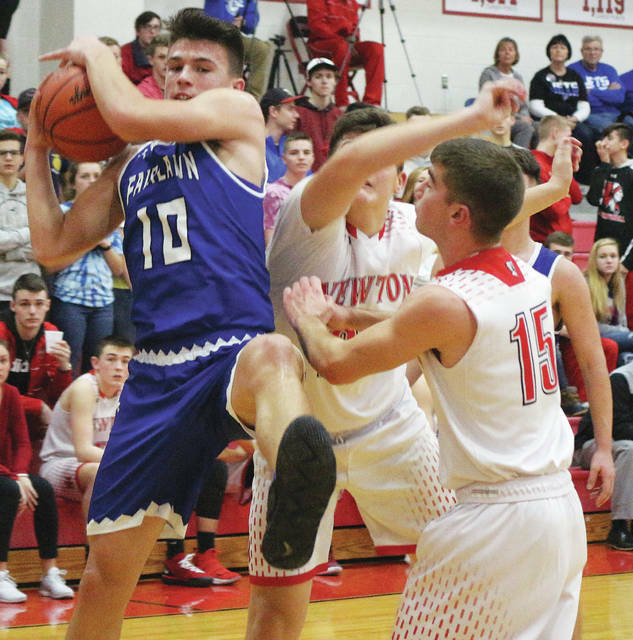 Fairlawn sophomore Skyler Piper comes down with a rebound with pressure from Newton defenders during a nonconference game on Wednesday in Pleasant Hill. Piper led all scorers with 21 points. 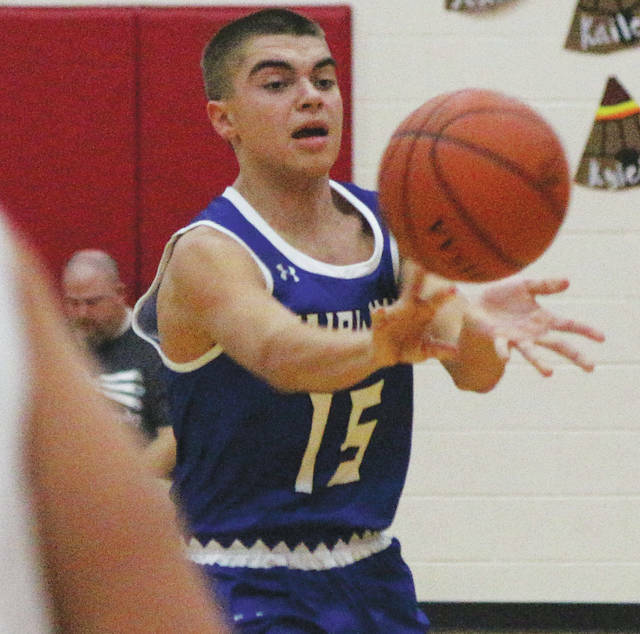 Fairlawn junior Isaac Ambos shoots with pressure from a Newton defender during a nonconference game on Wednesday in Pleasant Hill. Fairlawn freshman guard Dominic Davis passes during a nonconference game on Wednesday in Pleasant Hill. Fairlawn sophomore Ashton Piper looks to pass with pressure from Newton defenders during a nonconference game on Wednesday in Pleasant Hill. Fairlawn sophomore Jackson Jones guards a Newton player during a nonconference game on Wednesday in Pleasant Hill. He might want to schedule a few more following the Jets’ performance. Fairlawn made the trip to Newton for a game twice postponed by weather. And Wednesday’s trip home was likely slower than usual with heavy fog blanketing the Miami Valley. Still, the Jets persevered both the weather and the Indians for a 63-55 victory in non-league play. 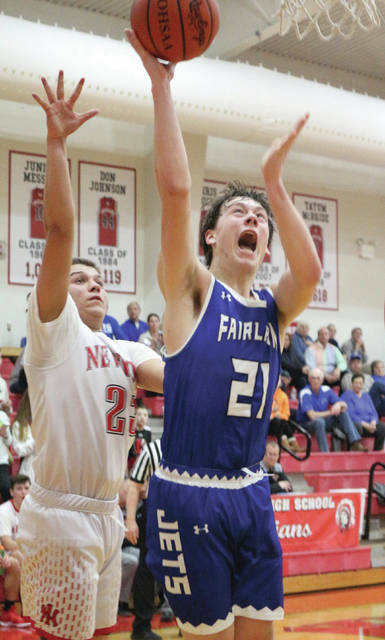 The win was the fourth in five games for Fairlawn and pushed its record to 9-9 overall. That’s a good spot to be in for a team that starts one junior (Isaac Ambos), three sophomores (Jackson Jones, Skyler Piper, Ashton Piper) and one freshman (Dominic Davis). Fairlawn’s biggest lead hit 17 points (52-35) with 5:51 left in the game. 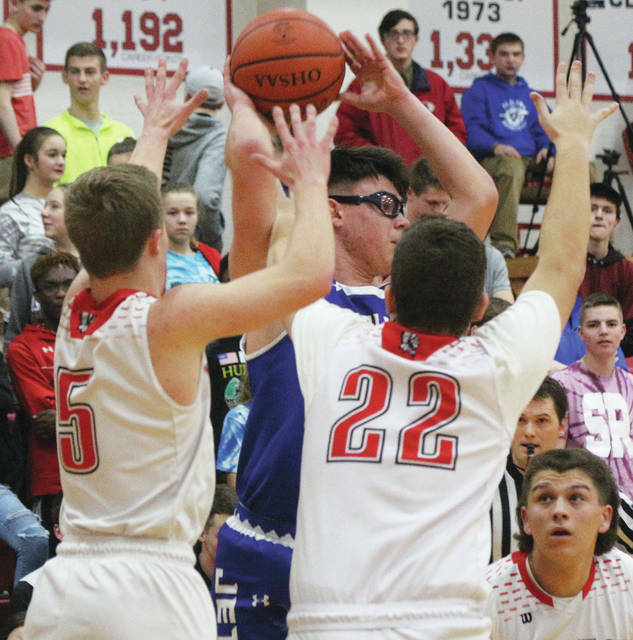 Newton’s full-court pressure — including consecutive turnovers that cut the lead to 52-42 — helped the Indians inch closer. The Jets never panicked and answered score for score to keep the deficit from dropping below seven points. Skyler Piper led Fairlawn with 21 points and Ashton Piper scored 19. Ambos added eight, Jones seven, Davis six and Lane Greiwe two. 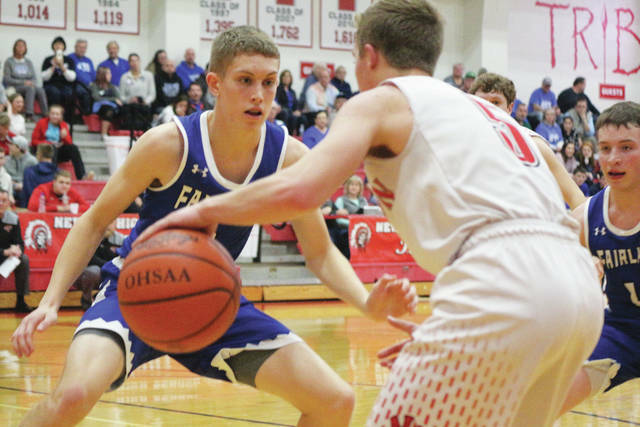 Fairlawn led 29-21 at halftime and pushed the lead to double digits with 5:07 left in the third quarter on a Skyler Piper free throw. The Jets ended the quarter on a 8-0 run with an Ashton Piper 3-pointer, Skyler Piper score in the lane and Skyler’s 3-pointer he banked in at the buzzer. Fairlawn scored two baskets in the fourth quarter, good enough as Newton sent the Jets to the free-throw line 26 times in the quarter. The Jets made 14 of them. The role for Davis continues to be help fill the void left from the hand injury to Drew Maddy. It’s possible Maddy could return for the tournament. The Jets have also received solid bench play from Garrett Kramer and strong senior leadership from Holman Rosales and Greiwe. “Lane Greiwe and Holman Rosales, our two seniors, have really stepped up late in the season and really carried our youth to be at the .500 range,” Tidwell. Fairlawn attempts to go over the .500 mark Friday at Houston (4-13). The last time the Jets posted a winning record (4-3) was back on Dec. 28 when they beat the Wildcats 58-55 on a last-second shot. This entry was tagged Ashton Piper, boys basketball, Dominic Davis, Fairlawn, Isaac Ambos, Jackson Jones, Justin Tidwell, Newton, Skyler Piper. Bookmark the permalink.